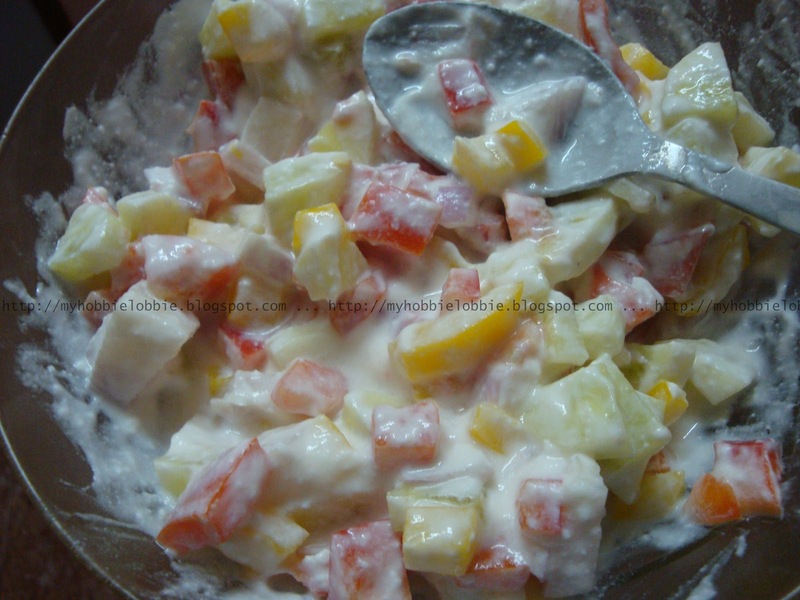 This is a salad like accompaniment that is widely served with Indian food. The dressing is a yogurt based one, which makes this salad ideal for warmer climates and hot summer days. Its really healthy, refreshing and tasty, of course. You will find a number of varieties of raita being served at an Indian restaurant. The base to all of these is identical, the veggies you find in these salads will vary. Today I've made a basic raita with an assortment of salad veggies which you can adjust to your liking. You can serve this with biryani, jeera rice or any other spicy Indian food. The yogurt helps soothe the palate. Mix the veggies in a bowl and season with salt, lime juice and pepper to taste. Beat the yogurt in a bowl. You can add a little sugar if you'd like to. Add the beaten yogurt to the veggies. Check for seasoning and adjust, if needed. You can garnish with some chopped coriander leaves. Trisha, this is a new dish to me, but it sounds light and delicious! Thank you for linking up to "A Little Birdie Told Me...". I feel honored to have you as a regular contributor. Your recipes and style really bring a lot to the party! Thank you Jenn, I love having you over so often. .. thank you for u'r kind words! I've had raita made with cucumber before, but this sounds even more delicious with the tomatoes and the peppers. Thank you for sharing it with Let's Do Brunch. Thanks for inviting me over Mehjabeen! Mmm....going to have to try this, too. I've not yet attempted Raita at home, but this seems doable. Thanks! It is fairly simple Kristi, you'll love it. Thanks for stopping by!